Farewell Harbour Lodge has the privilege of being in the epicentre of some of the most spectacular wildlife viewing opportunities on the planet. We offer 4 day all-inclusive packages including water taxi shuttle from Alder Bay on Vancouver Island whisking you deep into the heart of the rainforest. 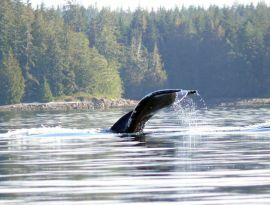 Our packages feature full day excursions in search of marine mammals, bears and other wildlife. We also offer 5, 6 or 7 day all-inclusive packages with additional days spent marine mammal viewing, on bear safaris, sea kayaking, rainforest walk (forest bathing/Shin Rin Yoku), First Nations cultural site visits or a host of other options. Guests can also purchase an add-on flight and fly round trip from Vancouver International Airport’s South Terminal (YVR South). For our standard 4 day all-inclusive package, guests depart Alder Bay on Vancouver Island mid-day and travel via water taxi directly to Farewell Harbour. The 25 minute water taxi ride into Farewell Harbour from Alder Bay is often a tour in itself as we head into the rich marine bio-diverse waters of Johnstone Strait and Blackfish Sound. Arriving at the lodge, you’ll be warmly greeted by our staff and provided with a short orientation, lunch and then settled into your rooms before heading back out onto the water for an afternoon marine mammal viewing excursion. After your afternoon excursion, join your fellow travellers in our dining room for a glass of premium BC wine or beer before a sumptuous supper. After supper, sit fireside in the lounge for an evening slideshow on some aspect of coastal ecology. After an early morning breakfast, you will head out on your first full day excursion. With daily excursions for both bears and marine mammals we offer both options on any given day. Typically, guests opt for a bear viewing excursion on their first full day. Our bear viewing excursions can take us deep into one of several different river systems in search of wild bears. We can travel 90 minutes to a system by a covered water taxi before disembarking onto one or two smaller zodiacs. By zodiac we will motor quietly or propel silently under oar to position ourselves for optimal viewing of bears foraging on the river or in the estuaries. In some systems we will disembark the zodiacs and proceed on foot or on small motorized vehicle and explore the lush rainforest in search of bears. As distinct from some of the other operations in the area, Farewell Harbour Lodge doesn’t use viewing platforms or utilize artificially created bear habitat to enhance our viewing opportunities. We prefer to seek out bears in their natural environment and view from small zodiac or from land on the same eye level as the wildlife around us. 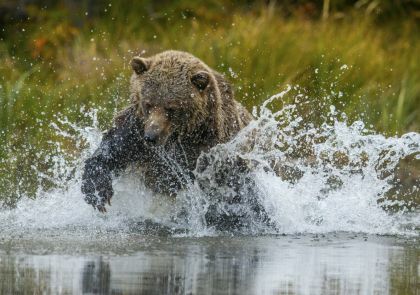 We can’t guarantee sightings but our trained staff benefit from many years of experience with bears in the wild. 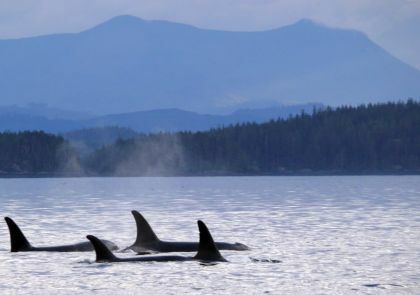 Our marine excursions take us into famed Johnstone Strait. 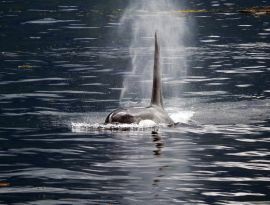 Literally at our front door, Johnstone Strait is renowned for its Northern Resident Orca population. The Orca come into these waters mid to late July and stay into late September and early October although exact timings can change from year to year. Prior to July our marine excursions take us on a search for the majestic Humpback Whales, thrilling Dall’s Porpoises or Pacific White Sided Dolphins in addition to the many Bald Eagles and seabirds. Our marine excursions can also afford an opportunity to learn about the cultural traditions of the Kwakwaka’wakw First Nations as we pass ancient villages sites, mysterious and moving rock art called pictographs and other evidence of a rich history and vibrant present in the region. Our last day affords one more opportunity for a morning powerboat excursion or an opportunity to relax around the lodge, try sea kayaking, stand-up paddle-boarding or fish off our dock before the water taxi departs from Farewell Harbour back to Alder Bay and on-going connections. Anyone over the age of 10 years old who is active and mobile with a curiosity and passion for the natural world is suitable for our tours. 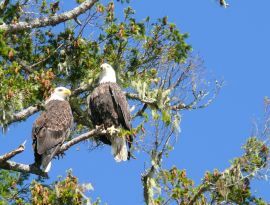 Our wildlife programs run from early June to mid October. We are proud to have our wildlife program recognized by Destination Canada as a 'Canadian Signature Experience'. Canadian Signature Experiences are 'are once-in-a-lifetime travel experiences offered by Canadians who are passionate to share their part of the country with you.' This certainly describes us! For more detailed program and pricing information, please contact our reservations office.